Easter is one of my favourite times of year as it’s several days off work but without having to deal with all the stresses that can come with the Christmas break. Plus, with the (hopefully!) more cheerful weather everyone is in a happy mood. It’s a good opportunity to enjoy some family time and it’s such a kid-friendly break as the world is awash with cute bunnies and chicks, seemingly endless chocolate and eggs to decorate. If you love getting creative in the kitchen then it’s also a great time to get your little ones involved. I’ve mentioned my love of Organix during my Baby-led Weaning posts. I really respect their No Junk Promise and the values at the foundation of their company. 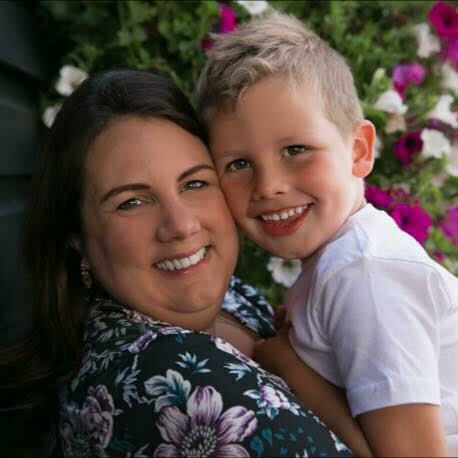 Because I baby-led weaned I didn’t use a lot of pre-made baby and toddler foods but when I did need quick, on-the-go snacks for Caterpillar I often chose from the Organix and Organix Goodies range. I’m really excited to work with Organix to share three brilliant recipe ideas with you, which are a perfect fit for the Spring/Easter period. 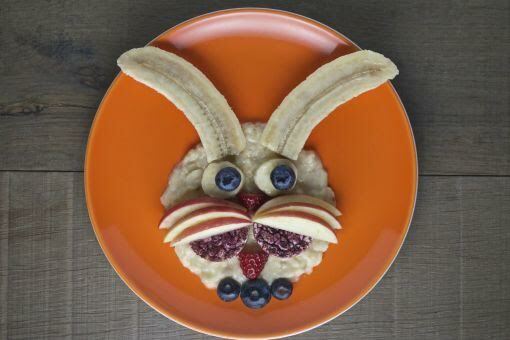 Your little ones will love this Easter bunny made with Organix Raspberry & Blueberry Rice cakes. Peel banana and cut in half. Mash one half into a puree, and cut two round discs off the other half. Then cut the remaining piece in half lengthwise from top to bottom. Cut the apple into 6 very thin slices. Cut the tip off the bottom of the strawberry, and cut in half to create two little triangle pieces. Create your picture: spread banana puree in a circle in middle of plate, add banana discs for eyes and long banana pieces for ears. Add blueberry eye pupils and bow tie, and some rice cake cheeks, then finish with a nose, mouth and apple whiskers. Embellishing your finished bakes is always the most fun part for adults and kids alike and all toddlers will love decorating these Organix #NoJunk biscuits, ideal for a tasty Easter Sunday get together. Preheat your oven to 180°C fan / 160°C fan/ gas mark 5. Stir the baking powder and ginger into the flour, then rub the butter and maple syrup into the flour with your finger tips, or pulse on and off in a food processer to combine into a crumbly texture, that will easily press together into a dough. Add a splash of water if needed to bring it together, but not too much. Flour a clean work surface and gently knead the dough, just to bring it together. Roll out to a 3mm thickness and cut out shapes using an Easter cookie cutter. You can add a small hole at the top of each biscuit if you like using a straw or a small sharp knife, so that the biscuits can be threaded with ribbon and hung up for an Easter display. Place onto the baking trays and bake for about 10 – 15 minutes until golden. Carefully transfer the cooked biscuits onto a wire cooling rack, and allow to cool completely before decorating. 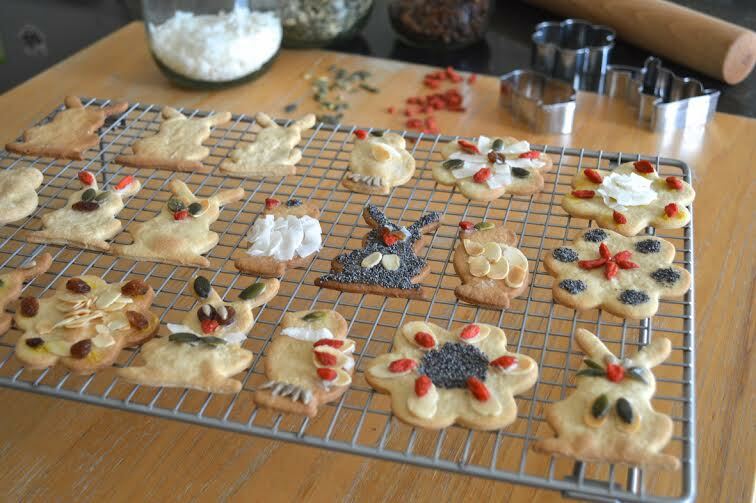 You can decorate your biscuits with a selection of dried fruit, seeds and coconut, or leave plain if you prefer. Decorations can be stuck to the biscuits using a small amount of coconut oil, maple syrup or honey. Raisins, cut up goji berries and seeds make fantastic eyes for a rabbit or a chick. Flaked almonds or flaked/desiccated coconut, make great wings and feathers. You can also use fresh fruit to decorate, but then the biscuits will need to be eaten straight away. First make your mango puree by taking the flesh from the mango and blending to a smooth puree with a hand blender or food processor. Preheat oven to 180°C, 160°C fan, Gas Mark 6. Place 12 paper cupcake cases into a cupcake tin. Sift the rest of the flour in gradually and fold lightly into the mixture using a metal spoon. You want to keep as much air as possible in the mixture, so be careful not to over mix it. Bake for 20 minutes until golden and springy to the touch. Insert a knife to check they are cooked – it should come out clean. Leave in tin for 10 minutes to cool a little, then move onto wire rack to cool completely. First you need to separate the coconut cream from the water. To do this, simply leave the sealed can of coconut milk in the fridge over night, so that the cream solidifies and separates. Turn the tin upside down when you open it, and the coconut water should be on top – pour this out, and reserve for a fruity smoothie recipe. Then scoop out the thick solid coconut cream to make the frosting. The secret to this simple frosting is keeping everything as cold as possible, so the coconut cream stays fairly thick. The cupcakes should be completely cool. The coconut cream and mango puree should be used straight from the fridge and ideally place your mixing bowl in the fridge to cool for half an hour before using too. Beat the coconut cream and mango puree together with the tsp of vanilla until smooth. 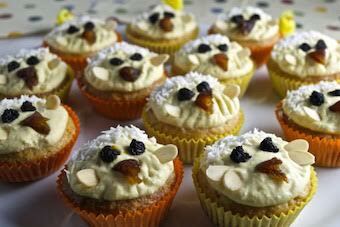 Spread the cooled cupcakes with mango frosting, then add two currents/raisins for the chick’s eyes. Cut the dried apricots into small triangles, then add one to the cupcake to give the chick a beak. Add two flaked almonds for wings (leave these off for younger babies). Finally add a sprinkle of desiccated coconut for fluffy feathers. Best eaten straight away! As these tasty cupcakes aren’t made with cane sugar they don’t keep very long. They’re best eaten on the day you make them. Otherwise keep in the fridge for up to 3 days, or freeze and defrost in just an hour, then add frosting and decorations. I love the way Organix have replaced all the usual high sugar decorating items with natural fruits and seeds, makes these recipes really unique. We’re absolutely not a sugar-free household, and have no intention of becoming one as I’m a strong believer in everything in moderation, but when you have very young toddlers or recently weaned babies it’s a good idea to limit the naughty ingredients, or if your child wants to bake every single week like Caterpillar does it’s good to have healthier alternatives. What do you eat at Easter? Does your family have any traditions? What are your favourite recipes to bake with your kids? I really hope you enjoy these ideas and keep an eye out for an upcoming Organix review and giveaway post from me. For lots more tasty family and baby recipes created by the cooks at Organix visit www.organix.com. Ah this is great! Seems like a more healthy Easter food option, while my son is still gulping breastmilk, I might make the cupcakes for myself ….okay and my hubby can have ONE! : ) Thanks for linking up with #StayClassy! Oooh, more great alternatives to a mass of chocolate!! I’m also a massive fan of Organix, their snack range is amazing! As my children rarely eat proper meals, I need to keep snacks everywhere! And the ‘no junk’ part makes me feel a little better that they aren’t just snacking on rubbish! In fact, on a recent picnic lunch with friends, one of them asked ‘umm, are you sponsored by Organix? ?’ as that was literally everything I had brought with me! I will have a go at some of these with the threenager (we need to do these things when the toddler is in bed!) he is so into baking at the moment! These are great recipes for kids to enjoy.